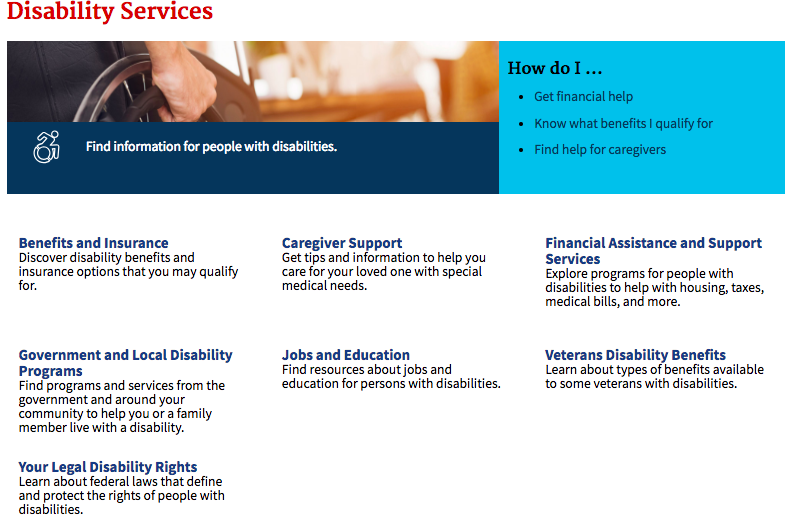 Disability.gov, the inter-agency government site that had provided information about government resources and programs for individuals with disabilities for 14 years, sunset in December 2016. When the website went dark, USAGov Contact Center agents were challenged to find other sites with appropriate resources to respond to inquiries. One year later, data showed that our agents were still struggling to find information to help the people who were calling in search of disability resources. Our content team began researching how to fill this information gap. This included government and non-government sites. We needed to see what information about this topic already existed. We started by reviewing what we already had on USA.gov. We found that most of the information about disability resources was distributed over various articles and, in most cases, a link to a disability site was accompanied by just one or two sentences or a short paragraph. Except for sites on disability laws, the other federal government information we found was limited, piecemeal, and not always easy to find. Private sector sites were generally tied to a particular charitable organization. How many hours they can work per week without jeopardizing their Social Security disability checks. How to find grants for augmenting their home or making home modifications. How to get grants to modify their vehicles. Whether someone can get paid to care for a disabled family member. After analyzing our findings, it was clear that the answer to our question about whether there was a need for a site with this information was a big yes. People were seeking information on disability services, employment, and financial assistance but were not sure where to find reliable government information on these topics. Based on our findings, we decided to create a section that would include both new and existing USA.gov disability content. The section would include information on unaddressed areas such as adaptive vehicle grants and service animals and under-addressed areas such as how to apply for disability benefits. The work for the new section was divided among writers and then turned over to our editor, who massaged each draft and made sure they all had the same voice. We wanted to make sure our new content was easy to find, so we conducted a Google Trend analysis to determine what to name the section. We titled the section “Disability Services” after finding that this phrase was used more commonly in searches than phrases like “disability resources”. As the editor reviewed the new content, our UX Team started planning the best way to organize the information. That work will be the topic of the next blog post in this series.